If you ever found yourself listening to someone who was saying something so absurd, so asinine you found yourself at a loss for words and the only response that comes to mind is to hit the person over the head to either knock some sense into them or knock them out, then dear Readers you understand the pain that I felt last Thursday while listening to the cable guy. Last Thursday a cable technician came over to replace my cable box, at least that’s what I thought he was supposed to do. He on the other hand thought that he could fix the problem and spent 45 minutes trying to adjust various connections to no avail. Now I knew I needed a new cable box because it had been troubleshot once before and the cable company set the appointment up to have it replaced. So I was surprised to hear him say” well looks like you need a new cable box but I don’t have one, I’ll have to call my boss”. (WTF? Again he was supposed to replace it!) He called his boss who said he’d be over in an hour. An hour? Was I supposed to entertain him for an hour? Turns out he entertained me (and not the way that is going through you head right now, shame on you). The cable guy felt safe talking religion to me, which considering the décor of my living room I can’t really blame him. The décor of my living room really needs to be a separate blog post but it shouldn’t surprise my longtime readers to know I have two huge medieval Crossed hanging on to wall along with three Buddhist Togas, various books on various religions and a menorah. The cable guy started to talk to me about Christianity which, I’m not a member of but don’t mind listening about, but when he started talking about evolution or the debunking of evolution I was at a loss for words. It’s not that I don’t understand evolution, I do. No, I was at a loss for words because of his ideas on why evolution is now debunked (don’t worry, it’s not). Where is my Superman, Dr. Tyson when I need him? Now, I wasn’t going to blog about this but Sunday was Darwin’s birthday and I was pretty miffed that I could not come up with a snappy retort to his absurd facts that he rambled on about for an hour ½ . An hour ½! Now before going farther dear Readers, this post is not anti- Christian. You may be surprised to learn many biologists whose views on evolution are solid are also Christians. Some of you may wonder how this can be. It is because most learned people understand that many stories in the Old Testament are allegories or metaphors, told to explain why things are the way they are. Most people of the Jewish faith (and let’s be clear it’s the Jews who wrote the Old Testament) understand this fact. It’s the fundamental Christians who are the ones that take the stories literally. Now back to the cable guy. So there I sat, listening to stories about giants being found in Israel, how the sun is shrinking at a rate that makes it younger than 4.5 million years old and that the Egyptians were white not Middle Eastern. I’ve read a lot about evolution yet as I listen to him I did know what to say. Of course nothing I read talked about giants being found in Israel, the sun shrieking at 5 feet a day and certainly have never read that Egyptians were Caucasian. So in this spirit of celebrating Darwin’s birthday I decided to look this stuff up. I started with the giants in Israel and spent over an hour Goggling the subject. It took awhile, because at first all I found were a lot of Creationist sites that had pictures of archaeological digs showing huge skeletons but nothing in any scientific journal or in any news sites. Finally, about four pages down I found this article from National Geographic. Apparently back around 2002 a website held a contest for graphic artists who were directed to show off their best photo shopping skills. 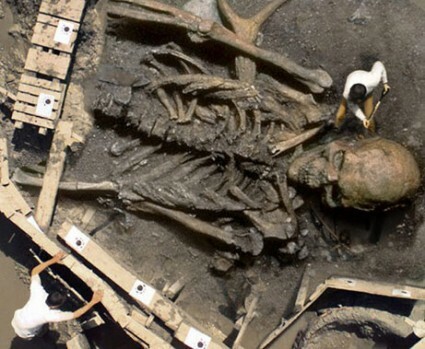 One of the contestants, a gentleman from Canada who wants to remain anonymous because of what has been done to his pictures, photo shopped a supposed archeological dig of giants. He won the competition; unfortunately somebody took those photos and made a bogus article that said National Geographic had found these in India. After Nat Geo found out about this they tracked down the original graphic designer who was horrified to find out what happened to his work. Next someone wrote another article using the same photos and said these were found in Saudi Arabia. Once again Nat Geo debunked this. Now, years later some Creationist sites are using the same photos as a way to educate their followers on” truths” found in the Old Testament. The pictures are amazing but again it didn’t take long to do some research and find the truth behind what our eyes are telling us. Now the shrinking sun hypotheses didn’t take as long to research but it is a little complicated (only because I’m not quite sure I understand the science behind this “fact”). Bear with me as I try to explain what I found. So supposedly the sun is shrinking at a rate of 5 feet an hour. If this was true then the sun could not be 4.5 million years old therefore our planet couldn’t be 4.2 million years old. Apparently there was a hypothesis about ongoing gravitational collapse of the sun called the Helmholtz Contraction; this was before we understood about nuclear fusion. There are two problems with this hypothesis: if we work backwards to even 6000 years ago (the age the Creationists claim is the true age of the planet) then sun would have been twice as big as it is now! Imagine how hot and bright Adam and Eve would have found their world to be! Could they have even survived such a hot world? Would anything? Talk about a nuclear summer! The other problem with this “rate shrinkage calculation” is an established fact it is NOT! No, the conclusion was published as an abstract to further scientific discussion not as a polished and final paper. It turns out the methodology in the calculation was wrong and the data has since been discredited. Oh but this does not stop creationists from stating this as a scientific fact. I’m not even going to touch the Egyptians were white theory, just as I wouldn’t touch the Egyptians were aliens (you can watch the History Channel for this one). If you ever find yourself starting to buy into someone’s farfetched ideas or see a picture that seems unreal, then please oh please, look up the facts before spreading it as gospel. Facts our are friends should be everyone’s mantra. As for myself, if I ever find I am in this situation again, I am either going to pick up Charles Darwin’s On The Origins Of Species or Richard Dawkins The Greatest Show On Earth and throw it at their head. That’ll shut them up. Previous Previous post: What would you miss if you were to travel back in time? Next Next post: What Lens Do You Use To View The World?